Grant McCann came out fighting in his last press conference. Photo: Joe Dent/theposh.com. Peterborough United manager Grant McCann insists he and his side will fight their way out of their current run of poor form. McCann was in bullish form during his weekly pre-match press conference yesterday (October 6). He held his hands up for errors he’s made on and off the field this season, but insisted negative comments on social media will only make him more determined to succeed in his first managerial role. Posh star Marcus Maddison is fit to play against Bury. Photo: Joe Dent/theposh.com. 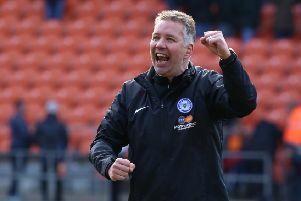 Posh host third-placed Bury in a League One fixture at the ABAX Stadium tomorrow (October 8, noon kick off) seeking to end a run of no wins in the last eight competitive matches. McCann had harsh words for his team after Tuesday’s Checkatrade Trophy defeat to MK Dons, but that performance has already been forgotten by those in the Posh camp. McCann said: “I’ve been proving people wrong in football since I was 14/15 and they told me I wouldn’t make it as a professional footballer. “I’ve seen negative comments about me and they honestly don’t bother me. I said when I took this job that I thrived on pressure and that’s still the case. Michael Bostwick is expected to start for Posh against Bury. Photo: Joe Dent/theposh.com. “I’m a big enough man to admit I’ve made mistakes with team selection and with comments I may have made to the media, but one thing I am, is a fighter. “I will fight tooth and nail to get this club into the Championship. Apart from the MK Dons game we have been close to winning most of our games this season. We were poor against them, but we’ve brushed that performance to one side to concentrate on the next one. It’s gone now, we can’t do anything about it. “We don’t need to panic. I know the ability I have in the squad and I know getting to the Championship will change their lives. I will turn it around and I’m looking forward to the day it happens. “The players and the staff will continue to work hard to get us back on a winning run. We will keep our feet on the ground whether we are winning or losing, but now is the time we need a bit more from everyone. “We’ve drawn five games out of the last six. Northampton started the season with five draws in a row and then won the next three matches so those draws then looked like good results. “Bury have also shown what a winning streak can do. They won five in a row recently and went from the bottom half of the table to second. There’s no reason why we can’t do the same. McCann will only tinker with his starting line-up tomorrow as he searches for that elusive winning formula. It’s expected Ryan Tafazolli and Michael Bostwick will form the centre-back partnership and Hayden White will continue to cover for Michael Smith at right-back. Smith is on international duty with Northern Ireland. Star attacker Marcus Maddison has recovered from the severe cramp that affected him in the final stages of the MK Dons match. Bury have selection issues tomorrow. First-choice central midfielders Jacob Mellis and Tom Soares are both suspended and star striker James Vaughan faces a late fitness test. McCann added: “I won’t make wholesale changes. It’s a case of finding the right formation to suit the players I have, It’s no use having a lot of good players in the squad if we don’t play a system that suits them. Remarkably Posh, who are currently 13th, could go fifth with a win tomorrow.